I’m a huge fan on TOMS, both the shoes and their One for One movement. If you’re not familiar with it, basically they give away a pair of shoes to a child in need for every pair of shoes purchased. It’s a simple transaction with a huge impact. 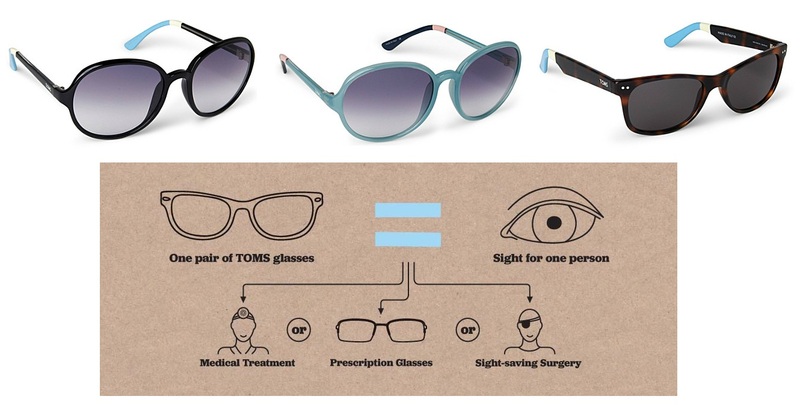 Well, now they’ve also launched an eyewear range which will also be supporting a similar initiative, but instead of shoes, with every pair of sunglasses purchased TOMS will give someone who is visually impaired either a pair of prescription glasses, medical treatment, or even sight-saving surgery. That’s impressive. Read more about the One for One movement here. As someone who’s passionate about ethical fashion, and did a Geography degree looking at all these sorts of issues, I had to post about this. It’s the kind of initiative I like best; it has a clear focus, a simple function and works to turn something that could be seen as a negative – consumption – into a beautiful thing. And not only that, but TOMS products are cool. I’ve picked some of my favourites above. The ones with the blue frames are probably my favourite, they’d look great with this season’s pastel colours and a messy top knot. So if you’re looking for a pair of sunnies to welcome in the summer, why not check out TOMS, knowing that you’re not only getting a pair of cool glasses but you’re also giving sight to someone. I mean, how awesome is that? wow, this is a brilliant idea by TOMS. i will definitely pick myself up a pair! Thanks for your comment 🙂 I agree, such a great idea! Glad you like it Katie! Love Toms. This is so great!